Add your awareness activity to the list. Get involved with similar activities. Join our team of support groups. Click here for more information about forming support groups. 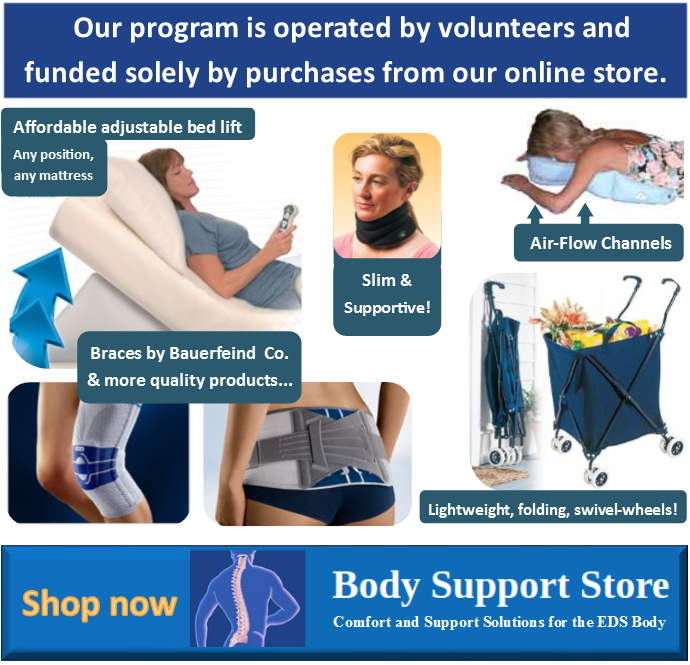 Click here for information about your EDS awareness shirt. 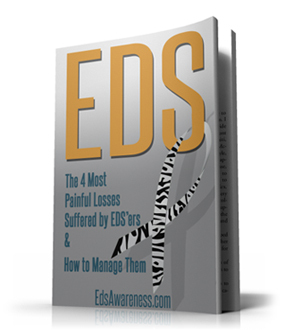 Click here for information about the EDS Awareness brochure. Our EDS Awareness Support Groups will be reporting on their 2017 awareness events on this page. If your group wants to be included, please send a summary of your activities to us at info@edsawareness.com and we will post them on this page. Click here to signup on line. I wanted to touch base about my Tri-State EDS Support Group activities here in WV. We started in person support group meetings at WVU-East Healthcare last March and within one year we basically are in the verge of outgrowing our space. The amount of people who have joined has surpassed everything I ever expected. Our only FB group just hit 100 members and we have about 50 active in person support group members with 25 in attendance the past two months. We even have caught the attention of physicians & med students who have also attended. Myself and three other group members went to NIH and Rare Disease Week on Capitol Hill. After meeting with Congressmen and Senators I left more motivated than ever. Our EDS Awareness Support Groups will be reporting on their 2016 awareness events on this page. If your group wants to be included, please send a summary of your activities to us at info@edsawareness.com and we will post them on this page. This year we are partnering again with the Chiari CSF Foundation (www.CSFinfo.org) to conduct nationwide walks for EDS and Chiari Awareness. On September 17, 2016 the Dayton Zebras participated in the Conquer Chiari Walk Across America 5K in Beavercreek, OH. This year the Dayton Zebras set up a selfie booth and EDS awareness table. We reached many people that had never heard of EDS. We were also able to reach people that did not know of a connection between EDS and Chiari. Some cried as they read the symptoms and realized they may have found the answer they were searching for. Thankfully, we had a great team there to offer hope and guidance. The Selfie booth was also a huge success and so much fun! I am honored that our group was able to set up and be a part of this. The Beavercreek Chiari Walk Across America 5K brought in over $20,000 for Chiari research this year. Thank you all for taking the time to come to UIC College of Medicine on 9/21/2016 to let us learn about EDS. We all really enjoyed the talk and learned how to diagnose this collagen disorder! We met children with Ehlers-Danlos-Syndrome to hear their stories. features of this collagen disorder, including Beighton score, and answered questions. My name is Laura Kayler, my friend, Sam, and I started a non-profit organization called, James Journey, in memory of my brother, James Kayler. He lost his battle to Vascular EDS (Type IV) in January 2014. Please join us in our 5k Run/walk in Barribgton IL. on August 7, 2016. God used Amy Coleman to encourage people in Him and His Word–even when she was struggling so horribly, she was reaching out to others and encouraging them. God also used Amy to bring awareness to EDS (Ehlers Danlos syndrome). Even at her funeral service, awareness was given due to the fact that a year ago, January 2015, due to Amy’s research and writing a proclamation for Governor Sonny Perdue and the Georgia Legislature, May is now EDS Awareness month in Georgia. They also approved a certain amount of Georgia’s money to go for research for EDS. Rules: Attached you will find a picture of a zebra bust that was designed and drawn by the artist Katie Zamudio, Doodlebug Coloring Books. Starting May 1, 2016 at 12:00 am until May 31, 2016 at 11:59 pm, all coloring images will need to be submitted via email to AlaskaHopeEDS@gmail.com or to my face book messenger. On June 1st, the images will be reviewed, and the winner will be announced within the week following. The winner will receive a prize from Doodlebug Coloring Books as well as their colored image being the poster of Alaska Hope EDS Support Group for 1 full year. I look forward to your entrees. Please share this post to help spread awareness for Ehlers-Danlos Syndrome. Here is a flyer I made up for the RI EDS group to help raise awareness this May. Next weekend (May 7-8) the RI EDS group is participating in a 5k benefiting Dysautonomia International. 500 of these flyers will be given out to the participants in the goodie bag, we will also have a table set up with additional information! I’ll keep you updated on any other events we do this month. Thanks for all you do to help the support groups and raising awareness for EDS! The April meeting of the Inland Northwest Ehlers Danlos Support Group was the biggest yet, and painting the coffee mugs was such a blast! May is EDS Awareness Month, so to raise awareness we are ordering some custom Inland Northwest EDS shirts to tie-dye! A Spokane-based printing company (IntegriTee) is willing to generously donate the shirts for FREE to our group, that means there is no charge for you! We are planning a Saturday meeting in Tri Cities, and a meeting on a separate Saturday in Spokane. Two meeting, one activity, one cause, and one goal! Please mark what day and location works best for you. Ehlers-Danlos Hoofbeat Run Walk-N-Roll will include a 1 mile run/walk/roll, a 5K run/walk and a ½ marathon run happening on August 6, 2016 in King Ferry, NY. “Dayton Zebra Teen” Caitlin Shipp has created a website and email address for all support groups to ask questions, seek advice and share their picnic experiences. We would love for all of our support groups to do something similar, even if its a small a picnic just for their group members this year. We will begin planning next years picnic sometime in January 2017 so that it is bigger and better than this years. EDS Awareness was invited to attend the International Symposium on Ehlers-Danlos syndrome in New York City, May 3–6, 2016. The primary goal is to reclassify the diagnostic criteria for all the types of Ehlers-Danlos syndrome. The symposium is also purposed with producing guidelines for medical professionals to use once a diagnosis has been reached as a universal guide for management. 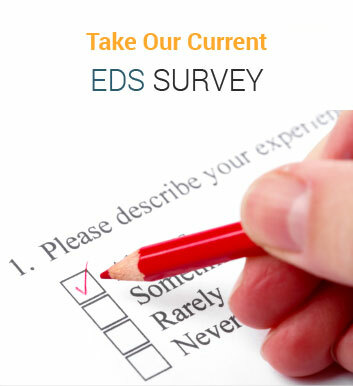 EDS Awareness published an EDS World-Wide survey with results to be distributed at the 2016 EDS Symposium in New York City, May 3–6, 2016. Our EDS Awareness Support Groups reported their 2015 awareness events on this page. If your group wants to be included in the current year’s report, please send a summary of your activities to us at info@edsawareness.com and we will post them on this page. John & Deanna from EDS Awareness were pleased to be presenters at the EDNF Conference in Baltimore. We were also a sponsor at the conference. We were able to connect with many new members who now benefit from our free programs and enjoyed seeing current members who stopped by our booth to chat with us. Here’s what the Asheville NC group has been up to …. I wanted to give you a few details about our very first EDS Awareness event held in Asheville on June 4 and 5. It was at the Southeast Pain Symposium sponsored by MAHEC (Mountain Area Health Education Center). We were able to set up an exhibit table with awareness and education materials in the main thoroughfare area of the symposium. Myself, Janet Bray, and Dani Gwizdala attended. (kelly on left, janet on right) – we both had injured our shoulders and were in slings – no kidding! Our exhibit was called “Ehlers-Danlos Syndrome: An underdiagnosed cause of acute and chronic pain”. We were able to talk with doctors, physical therapists, nurses, and other health professionals as they mingled between sessions. Some had heard of EDS, some had not, all were curious, thoughtful and supportive. One person we spoke with even felt she may have EDS. On our table, we had salt (to talk about POTS), zebra ribbons to pin on people, spoons (to talk about fatigue), EDNF brochures on EDS and pain, our support group flyers to pass out, statistics on the true prevalence of EDS (as prevalent as MS), diagnositc criteria sheets, a picture to show how EDS feels on the inside, a list of common symptoms, misdiagnosis w/ fibromyalgia info (since one of the symposium sessions was on fibro), a listing of common co-morbidities, business cards from our local Genetics office, and some multi-colored candy-coated chocolate covered sunflower seeds to give away – (a demonstration that what you see on the outside of an EDS patient is not what is on the inside – look at the whole patient!). In 2012 Mountain Area Health Education Center was awarded a Healthcare Innovation Challenge Award to increase knowledge and treatment options for Chronic Pain while addressing the increase in unintentional drug overdose epidemic in Western North Carolina. Funded through the Centers for Medicare and Medicaid Services, this project’s implementation is guided by the Triple Aim. The MAHEC project is testing a new delivery model of chronic pain management at a primary care level. As the grant comes to an end in June 2015, MAHEC is hosting a multiday conference to disseminate, to a regional inter-professional audience, best practices in Chronic Pain care through didactic lectures, panel discussions, audience response, networking events and skills based workshops for providers. The conference will highlight collaborative care that follows the Chronic Pain algorithm, how to link patients with appropriate levels of care, new skills that can treat pain in the primary care visit and complementary practices that are proven to help patients manage pain. Here’s what the Denver group has been up to …. For EDS Awareness Month this year we wanted to focus on spreading awareness in the medical community to bring much needed awareness to EDS and make our support group more visible to the medical community. We put together a newsletter for Health Care Professionals about EDS and encouraged our group to share with their doctors and other health care providers. We also put together a cover letter template to send along with it. It’s been well received! We put together our first EDS support group newsletter giving a more professional face to our group and activities. We will be participating in a CSF unite@night walk again this year – June 20. The University of Colorado Hospital presented to our group on May 13 about a research study on physical therapy for patients with joint hypermobility and how it affects us. Our local EDS support group was invited to meet with the medical study researcher about all the details involved in the research and how our group could participate. Children’s Hospital will be presenting to our group on EDS Diagnosis and Management on May 28. Although not specifically during May, we’ve met with Penelope, a horse with HERDA (Hereditary Equine Regional dermal Asthenia), the horse version of EDS. Penelope’s owner, Robin Davison, has presented to our group and we were also invited to visit Penelope. A great animal/human connection bringing together EDS & HERDA! Click here for information about the EDS Awareness walk in Cincinnati on 5/30. We had an article published in the local Cincinnati Enquirer about a family struggling with EDS. We participated in a number of EDS – CSF unite@night walks this year. The Michiana EDS group had their awareness booth June 5 in South Bend, IN. Feel these efforts are very worthwhile when you can give vital information to so many people. We made so very valuable contacts. I put up this poster at the YMCA I go to regularly. I am allowed to do this every May. I have answered many questions and keep printed information available to hand out. Others in Michiana EDS support group plan on similar activities. Austin EDS support Group Activities & Collage! We had nice group of artistic adults and kids who drew, painted and learned. It was nice to see the creativity of all! Our next meeting is June 13th and we will have neuro-nutritionist, followed by July speaker on personal training, Dr. Diana Driscol in August and SSA disability in September. Our year is filling up fast. We did our EDS Awareness activity early this year, when one of our members who has been very ill (Amy C.) successfully pushed through legislation to have May recognized as the official EDS Awareness month in Georgia! Now it’s state law. We have 187 members now, and our community is really becoming a deeply supportive place to share resources and meet in person. I was delighted to hear of our first official physician referral! EDSOK has a day at the Oklahoma State Capital on Monday May 11th. Group leader Jessica Adelman will be speaking briefly on the House floor following the renewal of the statewide resolution declaring May as EDS awareness month in Oklahoma. The group will also have a table set up in the Capitol rotunda all day to pass out materials and answer questions. Jessica and Dr. David Chorley, a local primary care physician who sees several EDS patients, might be interviewed on a Tulsa morning show as well. Still waiting to hear back for sure. We partnered with the Chiari CFS Foundation to host Free Local Educational Conferences with local doctors to discuss EDS and Chiari. Contact us to find out how you can recruit local doctors in your area and we can help you organize a conference. 2)–Team Zebra–May 16th– Come to the walk and join Team Zebra represent all EDSr’s throughout New England. Wear your zebra colors and join us for this wonderful opportunity to spread awareness and help show the Marfan Foundation we are active in all areas of awareness and would like them to promote and fund future EDS research. 3)–EDS Awareness Month in May–Once again, our Director of Community Outreach-Diana Cleaveland-has come up big and got Governor Baker’s office to sign this year’s proclamation for us to continue May as EDS Awareness Month in Massachusetts. Thank you Diana!!!!! During the month of May, we are planning to go to the State House and thank the Governor and his staff as well as provide them with more information on the many key points that we need help with. We will also visit House Speaker Deleo’s office who has been very supportive of all our work. We also will stop in on other legislators including Senator Petrucelli who is working on the Co-pay bill to reduce the burden on so many of us. Take part in our 2nd annual EDS Awareness Event at Miriam! May 4th-May 8th Miriam Hospital is allowing us to set up a table in the hallway for five days in May. The dates are May 4th– May 8th from 8am to 5pm. We will have a table with our Proclamation displayed as well as a couple of small posters with EDS information, information to hand out like the EDNF brochures and others that I bring to the meetings. You don’t need to be overly knowledgeable about EDS, we just need people who want to help that have been affected by EDS (yourself, friend or family member) We will have all the information to provide. It will be fun to get out and raise awareness for EDS and related conditions, and maybe make a new friend while you are at it. Ohio State provided free “Buckeyes Care” T-shirts, Foam Hockey Sticks, and autographed posters for fans. Answers for Erin provided free awareness bracelets and Ehlers Danlos Syndrome literature. The Columbus EDS support group provided an awareness display and banners. The event was advertised on Facebook groups, Twitter and Instagram and drew a large crowd including several EDS families from across the state of Ohio. It is estimated there were at least 200 fans of all ages in attendance. Most people who suffer from Chiari or syringomyelia will tell you: their conditions are not simple. Often, there exists a wide array of related disorders, including idiopathic intracranial hypertension (IIH), hydrocephalus, Ehlers-Danlos Syndrome (EDS), and dysautonomia, just to name a few. The 2nd Annual Charlotte Unite@Night will support CSF to provide education and increase awareness while funding research projects that can potentially find answers to help those who are fighting these disorders. Unite@night will be a one mile casual evening walk, in various locations around the country, during the month of June in 2014. These walks will bring together people who are suffering with the devastating effects of Chiari malformation, syringomyelia, Ehlers Danlos, hydrocephalus and related disorders. The Arizona EDS Support Group had our annual picnic on May 10th. We had about 30 people who attended. The weather was sunny and thankfully only a high of 97 that day. Columbus hosted an awareness tent at the Westerville 4th Friday event. The entire community comes out for the evening. Last year we were able to actually speak to over 200 people about EDS! In August, Columbus, Ohio is hosting an awareness showcase at our local library. We’ve been given permission to decorate the display cases with info, art, pottery, poetry, stories, printed postŷers, quilts, photographs (viewer friendly, please) zebra figurines, etc… about life with EDS. This event is open to contributions by anyone affected by EDS, including family members. We are looking for any of the above items to display. These items will be displayed the entire month of August at the Westerville Public Library. 1)The YMCA is giving bulletin board space to post information and about EDS. 2)We will have a booth the day before the Sunburst Races in South Bend, IN on May 30. We will put up posters and hand out information, and answer questions about EDS to many of the hundreds of people who come past. Previous years we have made contact with teachers, dentists, PTs, and even EDSers. The Dayton EDS Support Group will be featured on Radio promoting May EDS Awareness Month! On May 30, we had an awareness table at The Cleveland Clinic main downtown campus. campus. This was set up near the cafeteria area during hours when the doctors and medical staff are taking lunch breaks. We handed out awareness materials oriented towards medical staff. We provided our support group information card to give doctors who might see EDS patients. It was a great success! We talked to more than 30 doctors and many staff and patients! The St. Louis EDS Support Group will be featured on TV! Tune in to ABC30 on channel 12 on Saturday, May 10 at 12pm to watch! This will be a wonderful way to raise awareness during May’s EDS Awareness Month. For more information contact Diana at oriablue@gmail.com or myself, at wsalmgcdjm@aol.com . September 13th –New England Symposium-Manchester, NH-For more info.-contact Kaddy Ackroyd at kaddy1953@gmail.com. We had an event night at Jason’s Deli in Homewood, AL from 5 PM TO 10 PM where we will be raising awareness and raising funds for our nonprofit which supports individuals with EDS in AL and chooses to support EDNF’s research. June 7th we had a Summer Watermelon Festival at Homewood Central Park in Homewood, AL to raise awareness. Proceeds will be donated directly to research through EDNF. Attached is our event flyer. In preparation for our May 17-24 EDS Awareness week, we are going to have videos made of our members holding the Massachusetts Proclamation and each of us will say thank you to our Governor (Governor Patrick) for supporting us in our efforts. For the actual week, we are going to go to the Governor’s office in the State House and thank him and his staff personally. We are also going to take the opportunity to go around the state house and stop by all the state representatives that are in that specific day and tell them about EDS, our stories, etc. We also are going to send the media information on May being EDS Awareness Month and we hope to get interviewed or have an article printed on EDS. Columbus, Ohio EDS support group is participating in a May event located in Westerville, Ohio. The event will be held on May 24th during the Fourth Friday Celebration. This event brings the entire community out to the ” uptown” area for fun, food, fellowship and festivities. Our group will provide seating and tables for 16 people in exchange for a spot at the event to create community awareness. The Oregon group will be celebrating EDS awareness month with two events. Our first event will be a walk/rally at the Waterfront park in Portland, OR on May 18th, where we will be wearing our zebra shirts with pride and passing out flyers and business cards after we take a small jaunt through the park. Our second (but not least) event will be held on May 25th, where we will be hosting a mini-conference complete with speakers and with many doctors and members of the medical community in the audience. We expect to see greater than two hundred people, likely even three hundred as our RSVP’s continue to build! We were fortunate enough to receive a Proclamation from our Governor last month declaring May to be Oregon’s awareness month so we’re sitting pretty in that department. On May 22, the Cleveland group had an awareness table at The Cleveland Clinic main downtown campus. This was set up near the cafeteria area during hours when the doctors and medical staff are taking lunch breaks. We handed out awareness materials oriented towards medical staff. We brought our support group information card to give doctors who might see EDS patients. – On May 24, we had an awareness table at University Hospitals (affiliated with Case Western Reserve University) downtown campus. – On May 9, we had an awareness table and display at the Gilmour Academy’s 13th Annual Service Fair. This is a local private, parochial high school. Students are required to complete a minimum of 60 service hours prior to graduation. Approximately 300 students will be in attendance, which will provide us with a good opportunity to share information regarding volunteering opportunities with our group, and also talk to the students about EDS. – We have an awareness table at a large suburban church for “Disabilities Sunday”. The church is having this activity to bring awareness to all types of disabilities and encourage compassion & service to the community. There will be 4000 people in attendance at 4 church services that day. We will be handing out EDS awareness materials written for the public audience. – In January 2014, we will host an EDS presentation to the Greater Cleveland Nurses Association. The presentation will earn CE credits for the nurses. Typically, their quarterly meetings are attended by 40 to 60 nurses. Dr. Anna Mitchell, Geneticist, will present the clinical aspects of EDS. A panel of EDSers will participate in presenting topics such as: living with EDS, experiences with diagnosis, symptoms, etc. Nurses will be given talking points to discuss EDS with their doctors, and questions to ask patients when taking histories and discussing symptoms. The Carolians EDS Group is just starting and may not have an event this year, but we will wear our EDS awareness shirts proudly along with our friends and families on Saturday, May 25th. Adriana has been working on something for other groups if they want to…. hours. See ahead for the fliers. 2 hours, preferably around the lunch hour. FLIERS: We have 2 fliers in final draft form. available at the table at the medical school. Email us at info@edsawareness.com if you have questions about the programs.